Saturdays are my office days. I am basically chained to my computer from dawn ’til past dusk so that I can get some work done, hopefully uninterrupted. However, such is the life of a food blogger: I was going to make some recipes that need updated pictures on their posts. So, I combined work with real life and left my cave to make AND photograph our dinner. Ha! I know you guys might not care about the pics, but we’re old friends. Appearances matter. 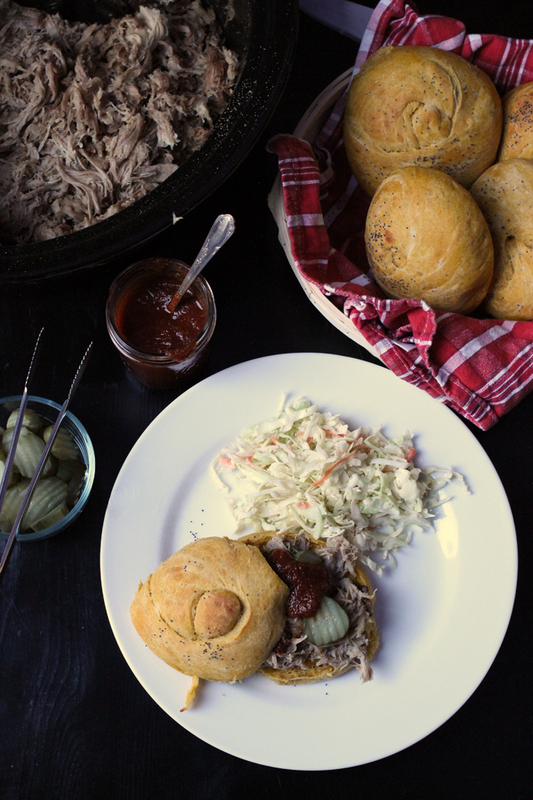 Unfortunately, I’m not sure that BBQ Pork Sandwiches are really all that photogenic. Just saying. In other news, my sourdough starter is looking a little better. Last night it was a weird brown clump. Tonight it’s bubbling and appears to be doing its thing. We shall see. As you might now already, we are a participant in the Amazon Services LLC Associates Program, an affiliate advertising program designed to provide a means for us to earn fees by linking to Amazon.com and affiliated sites. This weekend, I listed my Protein-Style Meal Plan on Amazon Kindle. If you’re in the US, Canada, or Australia, you can purchase the printable pdf straight from my estore. However, due to EU VAT restrictions, I haven’t been able to sell directly to readers across the pond. Now, you can get at least one meal plan via Kindle. If this one does well, we’ll convert more of the Month of Meals Plans to that format. 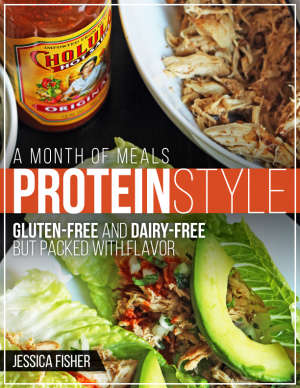 Find A Month of Meals: Protein Style on Amazon here. PSA over. Now to what we ate today! You’re doing so great with your stuff on Amazon- congrats on that. I’ve followed you for many years and I’m happy for your success. It’s seems we are climbing out of the ice age funk and having better southern weather! Yay! B – sausage and cheese scramble and the last of a jar of my home canned pears for hubs, dad ate with the old farts and I had fruit. The last of the sausage in the fridge. My big kids had their Pinewood derby today at two different locations…it was nice to be out of the house after being snowbound most of the week. I must go to the store tomorrow. We got a few staples at Sams yesterday but forgot butter and eggs, and now we are out ? Late breakfast after sleeping in. He had cold cereal with half & half which used it up since without the oven it didn’t get used in baked eggs. I had some leftover mac & cheese from the freezer. For supper I fixed a sausage and potato soup which used up another partial bag of onions, some hash brown potatoes from the pantry and some little sausages from the frig that needed to be used. For dessert I cooked some apples in the microwave using up the last two gala apples and starting on the newer red delicious I bought on sale at 49 cents a pound. I’ve got a beef roast thawing which will probably go in the crockpot Monday. It should be thawed by then and the leftovers used up tomorrow. I did some baking today. I made 2 batches of cookies, a batch of granola bars and baked off an apple pie I had in the freezer left over from Christmas. No fresh fruits or vegetables, no milk, nothing for school lunches, etc. We ate out last night, first time since Christmas. Had enough left overs for all our lunches today, but I hate paying to eat out. We see significant space now in the fridge and pantry. Both bins in fridge are empty, so we are doing well. Tonight we had chicken stir fry using onions, chicken and vegetables from freezer. It’s been a successful 20 days so far. Hi All! Finally gorgeous weather in the DC area, of course on the first day of the dreaded shutdown. This town. It’s almost like mother nature is rewarding this questionable behavior(from all sides). I don’t get it, but I’ll take it. It hit 60 and was sunny. We ran errands requiring lots of time outside and it was glorious. And a good Challenge day, too. D: great Challenge meal: I pulled together a mexican pasta salad with what was on hand, which turned out to be a lot of things: black beans/corn/olives/pasta from pantry, cooked grilled chicken from freezer, green onions/bell pepper from fridge, and mixed a quick sauce of salsa, sour cream and a little cumin. Yum! D – we had our granddaughters (3&6) all afternoon so I didn’t feel like cooking. Hubs made a Panda run. Today was a huge effort for me to eat; Hubby had a terrible cold last week like so many others and today, I decided to join the “party.” I felt miserable all day, sleeping on and off; stayed in my pajamas. But I took Theraflu and cold eze every four hours and by the time I woke up, this morning, Sunday, I felt a lot better; not 100% but much better than yesterday. For anyone who has never tried Cold Eze, it really does work; lessens the severity of the cold and the duration. Ugh so sorry you’re not feeling well. It does sound like it isn’t the flu, though, which is a bright side. Keep on taking it easy. Glad you are feeling better today Stephanie. What ever is going around here is lasting 2 1/2 to 3 weeks and is really knocking everyone down and that is with their prescriptions. So far, there are only 2 of us in our whole family that have not got it and they are saying that the worst is over. Sorry about the crud. It is EVERYWHERE and just awful this year. We have been lucky that though we have had a lot of sickness it’s been pretty mild compared to what it could have been. I hope you are all better soon. B – I had a handful of peanuts, he had an organic toaster pastry thing we were given. I’ve never been a fan of those (Annie’s is better than PopTarts but still seem like cardboard to me). It was only about a 4lb roast but it made so much meat! We had a hearty meal since we had skipped lunch and were very hungry, yet I still have two big containers of the shredded leftovers. One will definitely go into the freezer. It was part of a whole loin, so I sliced some into chops that are marinating in the fridge and diced up the rest and froze two different packages with different seasonings so I have a quick skillet meal option for some night we want something fast. Oops, I posted under the wrong day. S: snow cream! from the 6 inches that still remain after a day of 50 degree temps. Okay, so do any of you who frequently get snow ever fix snow cream, or is that more of a southern thing? Since I’m in a less developed area, without smog and with good air quality, I hopefully didn’t ingest any contaminants ? I didn’t have any condensed milk that is typically used here (and since it’s the PC, I wasn’t going to go buy any! ), so I subbed my French vanilla coffee creamer. Good! Mona, we could have had a LOT of snow cones here as well with our 2 prolonged snow storms. I even put my snow cream leftovers where? In the freezer-for later! LOL Still have 3-4 inches in our side yard, despite two days of 40-50 degree weather. We went to the beach today and there is even still a bit of snow on the sand dunes! Absolutely wild. I’m in NH and I remember eating snow with maple syrup drizzled on top as a kid. Yum! Maple syrup-now that sounds delicious! We make snow ice cream with fresh snow, milk, sugar and homemade vanilla extract . Julies, your recipe is actually how my family has always made it. Others where I live now use sweetened condensed milk. Sometime I want to give that a try. Since I’m out of milk (only have powdered and evaporated in pantry), the creamer was kind of like the milk, sugar and vanilla version, just all in one. I make my own vanilla too, but the beans have skyrocketed in price so I’ll not be making anymore until-hopefully-the prices come back down. Oh yes, prices are so high now! I was fortunate to make a gallon a couple of years ago before the huge increase although it was still much higher than when I started in 2010. I’m just used the last of my homemade from 2 years ago. So sad. I didn’t ‘make any this year due to the cost. I’ve decided to break my self imposed fast of not buying groceries this month as I desperately want some lettuce (weird the cravings you get during PC) I have visions of hamburgers with homemade buns and tacos coming up in the next week. I am off tomorrow for a two night trip to the ocean with girlfriends staying in a condo right on the beach. We’re getting pizza one night and having cinnamon rolls for breakfast. The waves have been awesome on the Wa coast. Looking forward to a fun time. LOVE that you participated in the March. I had other plans yesterday, and also no one in particular I could go with. My college student daughter and her friends participated in one of the many sprinkled throughout Utah- they stayed up until 5am making signs that turned out awesome. Ah to be that age again (but only for things like this- otherwise, I like being a little more “seasoned”.) Have fun with your friends/escape!! Winter is supposed to return to Nebraska tomorrow. We have had temps in the 40’s for the past 2 days and it has been glorious. I even washed some windows. I still don’t need anything from the store so right now the plan is to pickup the ground beef I ordered. Next week we will need salad stuff and bread. Breakfast–My husband had an omelet using l/o veggies and steak in the fridge. I had my pb toast. Lunch–He had chicken salad with crackers l/o from Christmas and a couple of cuties I skipped. Dinner–I took the last of the steak and veggies in the fridge and made a egg scramble adding onions and hashbrowns from the freezer and ww toast. My husband went out to play cards and ate there. My husband and son had 5 guys last night. Yum. I had chicken soup, it’s a diet thing. Husband out of town til Fri this week boys are easy to feed, I’ll make curry with cauliflower rice for me for lunch everyday. I froze cauliflower earlier in the month. Thur. Some kind of chicken, I have whole chickens in the freezer. I still have frozen veggies and I bought some apples. I’ll bake a dessert at some point this week. B- Oatmeal for the husband. He wasn’t feeling well yesterday so went back to bed after I got dressed. I had an orange and left the house to join up with my oldest daughter, her husband and friends to march downtown. The weather was cool and invigorating and the marchers were peaceful, clever with their signs and made me proud to be with them all. L- chicken salad sandwiches on toast. D- I made Jessie’s peanut butter chicken but cut it down to servings of 4 instead of 8. It is delicious, quick and simple to put together. The leftovers will be my lunch today. Cookies from the freezer for dessert. Time to stick my head in the freezer and figure out what’s for dinner tonight. Glad you liked the Peanut Butter Chicken! 1/20 – I definitely have DS’s cold now. Glad it’s a slow weekend for us! late night snack (me) – some popcorn shrimp from the freezer and an individual bag of fritos. Colds make my appetite weird! I loved surprising the kids with things like that. Breakfast: pulled pork and an egg on toast and coffee for me. Hubs had cereal and milk. Lunch: I had snacks at the training I attended. Hubs had a ham sandwich. Dinner: beef and bean enchiladas, all made with little baggies from my freezer. Had the meat mix already packaged up from months ago, and this used up the last one! Also had the beans packaged up from many, many months ago. Only two of those left! A very delicious dinner! ooh, good idea to use the pork with the eggs. The pork I made had a dry rub and I was apparently a little heavy-handed with the salt so I’ve been trying to think of how to tone that down. Making some runny eggs with no salt would definitely help. Thanks! What about adding to scalloped potatoes and don’t add salt? It’s a favourite for breakfast! Great idea to use it to help offset the saltiness! Rice might help absorb some of the salt too. Breakfast – grits, hash and egg over easy. Dinner – took a leftover cooked chicken breast from the freezer and made chicken and dumplings for dinner with chicken broth in the fridge. Served with salad. Bought a honey, sliced, spiral ham today for 89 cents/lb. What doesn’t get eaten will have to go in to the freezer next week. I should have some room for it by then! LOL! L- buttered toast, cheese , kiwis , blueberries . D BBQ chicken from freezer , brown rice , frozen peas. Husband went to Aldi and got more produce and bread and eggs. He thought kids would like bread on hand, and it will make lunches easier for sure. That sounds like a fun thing to experiment with! Snack was a microwaved banana muffins covered with homemade vanilla pudding. The chickens got the leftover split pea soup. Tomorrow will likely be leftovers again. My grocery list is small, only some dairy and spices and possibly bread. I’m still at 43.60 for the month. Can I keep it at 50$? Im failing at the pantry challenge…:(. With 2 birthdays in the past week, we ate out one evening (total splurge) and a BBQ at our house and had to shop for the menu requested by the birthday girl. I incorporated whatever I could from our pantry, but really felt like I had to purchase quite a bit. Good news? Today was leftovers all day- burgers, corn chowder, chips, birthday cake/ice cream and crepes. I’ll have to adjust my meal plan going forward. Not a failure. Birthdays should not apply to PC unless you’re absolutely destitute. Don’t think of it as failing, think of it a coping well with special occasions that existed in the middle of the challenge, but are not part of it. You did have a day of leftovers and can adjust the meal plan. In fact you are coping quite well, it seems to me, and need to be proud of that. The ability to adjust and cope are very important skills! After all, this challenge is a self determined goal type of challenge, where my goals, your goals and someone else’s goals may all be different. Be are sharing the journey and providing moral support for each other. This weekend was busy. Seems to be the name of the game around here. Three younger kiddos got their flu vaccines at the ped office back in October. Oldest had a swim meet that day and missed out. So, took the oldest to get his flu vaccine at target, got a $5 off coupon for putting him through that. (Haha. Kidding. He knows with 2 parents in medicine complaining will do him no good lol). I grabbed some Dave’s killer bread and bagels while we were there and used my coupon. Son also grabbed some protein bars. Spent $18. That’s the least amount of money I have ever spent at target so yay! Lol. I made quesadillas with the leftover pork I had from Thursday. They were good. I added black beans and Monterey Jack cheese. Made some fresh pico and we were in business. I threw some hot sausage from our last pig in the slow cooker yesterday. Seriously the best sausage we have ever had. The texture and flavor is amazing. Sadly we are down to our last couple of packs and no pigs will be ready for a while. So we’re savoring it. Lol. Made a double patch of pumpkin choc chip muffins. But I used puréed butternut squash since I still have a bushel or two in my garage from the garden. I pulled out some bananas from the freezer too, so hopefully today I’ll make banana walnut muffins. Also need to hard cook some eggs since the hens are picking up and and I have some extras, cut some veg and fruit to make my 415am mornings this week easier, and just do some other organizational stuff to simplify this week. Monday’s are rough for us. I work until 130, one kiddo picked up on the way home, next One from preschool at 230, then dance class until 7 with one. My oldest works tonight so I have to drop him off- and in between there somewhere actually make dinner AND feed my horses and such. I am always so tired on Monday’s. Lol. You are one busy woman! 4 kids, a demanding job, a farm…. I’m impressed. I bet those butternut squash choc chip muffins are good. What a great use of all the squash you have, that you grew. And, I love that you doctor up the sloppy joes like that. when kids don’t know what they’re eating(because then they’d refuse– my son was always that way, but not my daughter), it is such a win! Thank you for the kind comment. I am really, at times, not sure which end is up though. Lol. I tell everyone I work to Relax. It’s kind of a break and it helps that I insanely love what I do. I remember growing up my mom would make orange mashed potatoes- she’d add shredded carrots. I’ve never done that, but I sure remember loving them. Thanks for reminding me of them. Things have been kind of crazy and I got bummed and lazy the last few days. Needless to say we spent more money than we needed on food, though we are absolutely still going to be below our monthly budget. We were doing so well so I’m a little disappointed, but we have had RSV from Kid 2 in the house, then a fever/cold thing going on with Kid 1, so he won’teat , and then last night because there just wasn’t enough “excitement”, Kid 2 (she’s 2 1/2) fell off of the bed and gashed her head on the night stand. Thankfully there was an urgent care open and we got away with the glu instead of stitches. Ug. I need to go through and figure out what we have spent, but meals yesterday were so strange. Breakfast: My husband took my daughter to church and I stayed home with sick Kid 1. I had leftovers from dinner the night before (pasta and shrimp) and he ate nothing. Lunch: My daughter had a piece of pizza leftover from Friday and a clementine. Son ate nothing again, and I had ramen that I found in the cupboard (so healthy)…. Dinner: We are low on easy to make foods, and I really didn’t feel like pulling something out and making it after the trip to urgent care and getting back late, so my daughter had yogurt and fruit. I had pasta again, so felt completely awful going to bed. My husband had picked up a milk shake for my son, and he drank part of that. I can’t wait for spring! I need to get organized tonight though so that we don’t get completely off track again. Sick and injured kids really put a damper in things. Hope this week is better in your home!! We took a break from the pantry challenge for the weekend to attend our annual “siblings and spouses” weekend away with my brothers and their wives. I spent entirely too much money on goodies for the weekend, but the good news is that we all over bought so we have plenty of snacking material in the house for the immediate future! Also, because I’ve been spending a lot less on groceries than normal, I didn’t completely blow the budget for the month. Yum – that sounds amazing! Thanks! Sounds like a fun break! My husband made a point to tell me that we only have one more bottle of ketchup in the pantry. Gasp! I will need to shop once more this month and to stick to budget I’ve only got $65, which is doable if I don’t buy any meat. We should be okay though, it’s just that my people like their ham and bacon with breakfasts. Only 9 more days in January! My youngest has gotten jumpy about the dwindling bottle of mustard. LOL! Hubby and I went over to the Chicago area for an RV Show for the whole weekend. The pantry challenge was sort of on hold. The boys stayed home and I don’t know exactly what they ate for every meal. By looking at the recycle bin it involved a lot of pizza. #1son would eat pizza everyday if I let him. So I would say he ate pizza everyday since we weren’t around. I have to ask if anyone has seen this before at a hotel. In the bathroom there was a tv integrated into the mirror. Every time the bathroom light was turned on the tv also turned on. The mirror never fogged up. I suppose, so you could watch tv all the time. Little things intrigue me I guess. Wow. That’s one I never heard of before! That’s television dedication. It’s crazy, but don’t have to worry about missing the good part in the movie I guess. So my bff just renovated their master bath. Her husband is quite the techy guy and he decided they needed a tv in their mirror. He figured out how to do it, and instructed the contractors on how to install it. I have to say, it’s kinda cool. They have always loved their morning news, and now they can watch while getting ready in the morning, and not just listen from the other room. It’s certainly extravagant-feeling, though. Brunch: Scrambled eggs, bacon, HM baked beans, bread, coffee and juice. Bacon, baked beans and ice cubes made of juice came from the freezer.